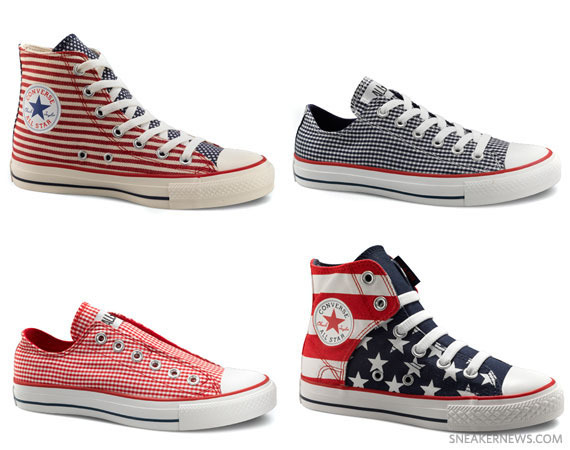 BLVDAVE: Converse Americana Collection – Available NOW !!! Converse Americana Collection – Available NOW !!! Cookouts and BBQ’s, 4th of July right around the corner-yep it’s definitely summer time. Converse is dropping the Americana Collection to coincide perfectly with the onset of the warmer months, utilizing some classic patterning on a group of Chuck Taylor All-Stars that is definitely familiar for anyone fond of Summer in the USA. The All-Star Lows in this pack are wrapped in a gingham print, the instantly recognizable checked motif that is seen at many a picnic when the weather is hot. The two Chuck Taylor All-Star Highs included in the Americana Collection bring new meaning to the “All Star” name, dipped in the stars and stripes of the US flag. This batch of summer footwear never strays from the red, white, and blue color set up, and the pairing of such iconic American patterns just makes sense on an American footwear classic like the Converse All-Star. Continue reading for a better look at each shoe in the pack and then head over to Converse to snag a pair now.